Every pet owner will feel bad leaving their dogs at home when they go to work, or you have a business trip outside your town. Thanks to the modern technology, you no longer have to wonder what your dog is doing all day. A high-quality dog camera will also ease your worries that your dog might ruin your favorite sofa or chase a poor cat again. In monitoring your feline friends at home, here are the top 10 best dog cameras you should check out. Now you can play fetch with your dogs even if you’re miles away from them. All you need to do is fill is with at least a hundred of your dog’s favorite treats and play catch while you’re inside the bus traveling to other towns. You can control the device using an application that can run on both Android and iOS phones. Its 1080p camera and night vision allows you to live stream with your dog all day long. The 160-degree view angle will enable you to monitor your dog all throughout the day. It offers a 2-way chat and barking alert. 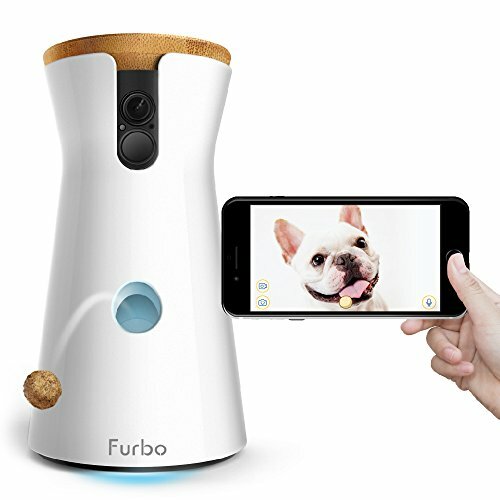 The Furbo’s barking sensor mode will automatically send a notification to your smartphone if it detects your dog barking. In that way, you will know what’s going on at home. It also allows you to calm your dog when he’s upset over the bird that flew past the window or wants to play. 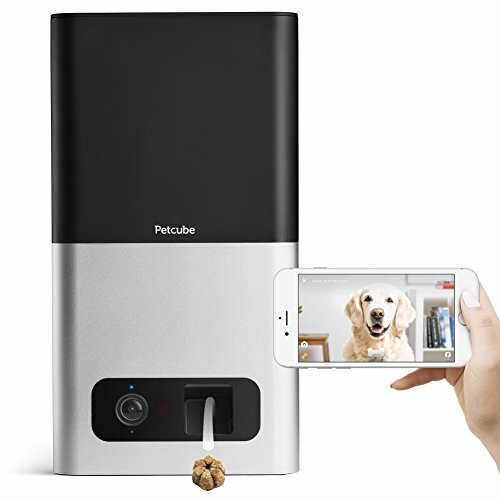 Make sure that your dog is doing well even when you’re away with this all-new pet camera from Petcube. It features 1080p HD video and night vision for full-time monitoring. The 138-degree wide-angle view allows you to know what your dog is up to anytime. See your dog up close with its 3x zoom feature. It also has a built-in treat dispenser that allows you to schedule treating your dogs when he’s home alone. You can use both dry dog and cat treats. The device can fling up to five treats at a time or control the number of treats that it dispenses utilizing the product’s application. In that way, you can manage your dog’s diet even when you’re not around. The two-way audio allows you to speak and listen to your dog when it barks. Its cloud video recording will make it easier for you to video chat with your dog and send your regards to make him feel less lonely. 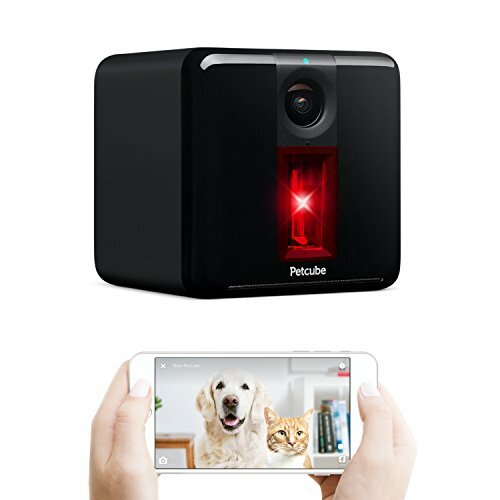 Another product from Petcube is this all-new pet camera for your dogs and cats at home. The 1080p HD video allows you to monitor what your pets are doing when they’re left alone in the house. It also provides a 138-degree view angle and 3x zoom if your furkid is acting suspiciously in the corner. The two-way audio feature of this device allows you to talk and listen to your dogs. It also helps you to calm them down if they’re barking restlessly at the cat next door. Now you can see the last four hours of video activity of your pets thanks to its free cloud-based video storage. There are no subscriptions required. Should you want to have a full-time 24/7 video monitoring with your dog, contact the Petcube for a full subscription. Are you curious about your pet’s secret life when you leave at work? 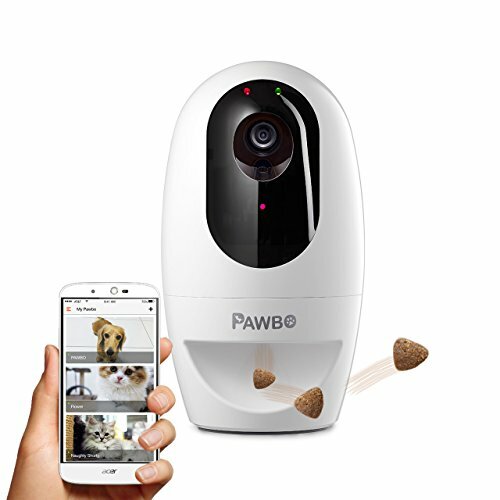 Check out this pet camera from Pawbo. 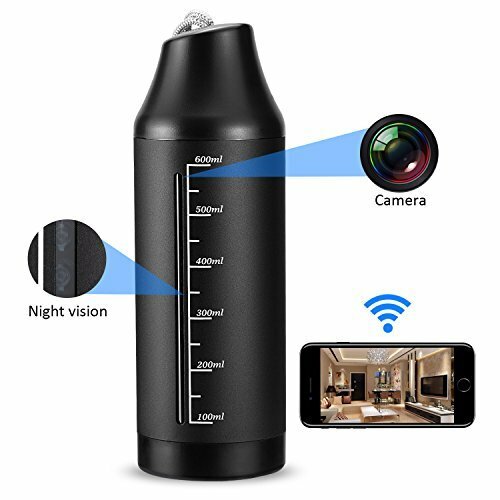 Its 720p HD live video camera, 130-degree wide-angle lens, and 4x digital zoom allows you to save every precious moment in your phone while you are working. It features a built-in speaker, microphone, laser, and treat dispenser. In that way, you can play, talk, and listen to your dog to ease their loneliness while waiting for you to come home. You can share your pet’s favorite phone online thanks to its instant social sharing. The package includes accessories. Up to eight users can connect simultaneously with this device. It supports both Android and iOS phone for easy connectivity. 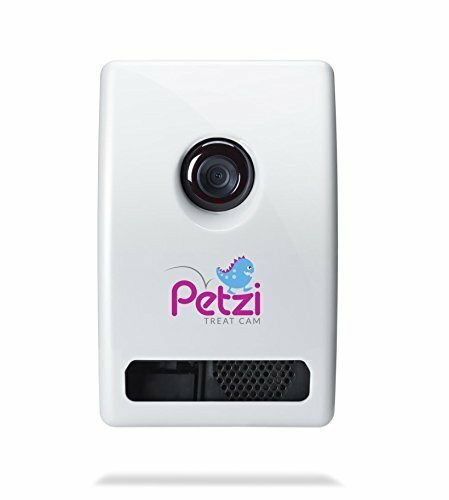 Even from afar, you can greet and treat your pet with this pet camera from PetChatz. Now you can connect and interact with your pet using your mobile device or desktop. Upon setting up, attach it to the wall. It has none sharp edges or cords that your pet might chew when he’s bored. Your dog will see all your grinning face on its full-color LED display in this unit. It also features an aromatherapy dispense that will help you calm your dog. It can help when he’s upset or barking at the passers-by outside the house. You can also live stream with your dog using its stream DOGTV that requires a subscription. Now you can catch the most hilarious and funny moments with your dogs thanks to its PetChatz Petwatch that automatically records at least 30-second video of your pet acting up. Are you looking for a quality pet camera and pet dispenser to keep your dogs entertained while you are away? Check this unit. After downloading the application, you can monitor your pets using your Android or iOS phone. The wide-angle camera features a night vision that allows you to peek into their secret life when you are not around to play with them. If you want to talk to your pets, click the button and it will dispense up to three treats in the camera field view so you can watch them enjoy eating. It’s also a great way to snap into them or start a video chat when they are near the camera. This sleek and wireless pet camera allows you to interact with your pet all day long. You can set up the device within five minutes only. Plug the cable, download the application, and chat with your furry friends. It features a built-in microphone that offers a two-way audio experience for you and your pets. The motion detection also provides an alarm notification with your phone and automatically emails the pictures to you. You can use a micro SD card of up to 64 GB and take snapshots of the video. Its 720p HD and 350 degrees horizontal and 90-degree vertical rotation range allow you to monitor what your pets anytime you want. The advanced night vision with 12 built-in infrared LED beads helps you to extend into the dark with no light pollution at all. 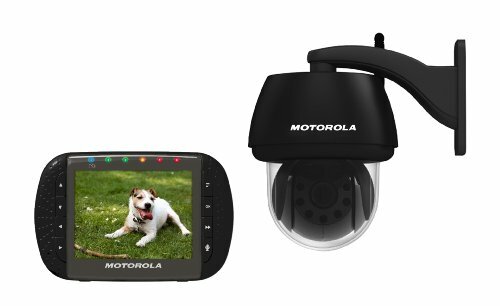 The 3.5-inch full-color LED screen of this pet camera from Motorola allows you to video chat with your pets anytime you want. It features a remote camera control to pan, tilt, and zoom whenever you like. Its infrared night vision will keep you monitoring your pets even at night and see what they are up to in the dark. Monitoring experience is improved thanks to its 590-foot range. This pet camera is ideal to use outdoor if you keep your pets outside the house. 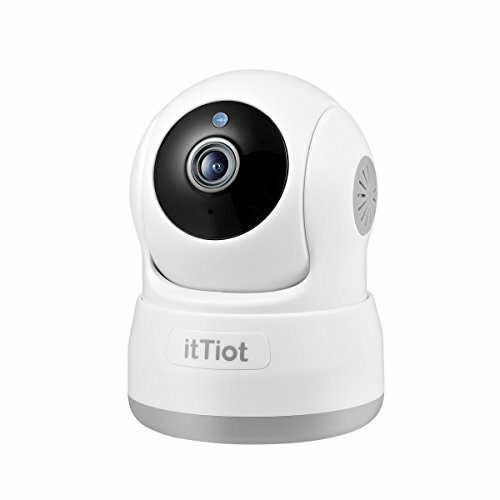 It also serves as both your pet and security camera with its advanced technology. The crystal clear 720h HD camera resolution and 230-degree wide lens allow you to monitor and regulate your dogs when you leave them at home. 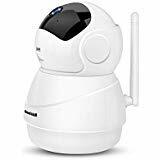 This wireless pet monitoring system also allows you to pan and tilt the camera up to 355-degree coverage to know what’s going on with your pets. It also offers a night-vision and two-way audio, video-chatting with your pets will never be a problem at all. It records video 24/7 and can accommodate SD card up to 128GB. You can save and play the videos later on your laptop. The device can cater for up to four persons simultaneously. The professional lens of this model features a 112 wide angle, 350 degrees horizontal, and 100 vertical rotation for full-blown monitoring of your pets. After downloading the application, plug the device, and it’s ready to use. 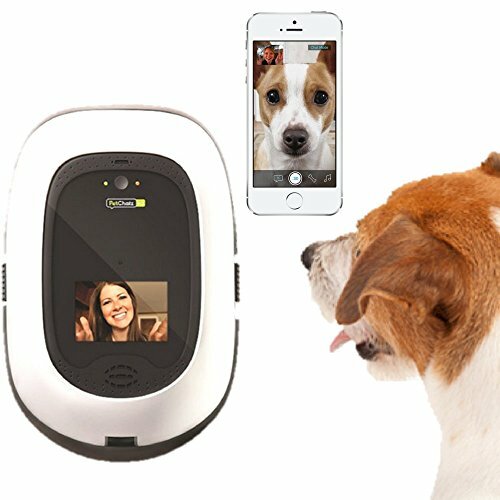 Video-chat with your pets all day to make him feel less lonely until you get home. It offers a two-way communication thanks to its built-in speakers and 720p high-resolution camera. It’s an ideal choice if you want to soothe your pets when they are anxious or upset. The device also requires SD card for saving the video recording of your pets playing around.